(Travel + Leisure) -- What would you expect to pay for accommodations in a palatial, elegantly decorated suite in one of London's most famously posh neighborhoods? 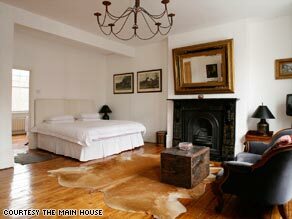 Main House guests stay in an 1840s Victorian terrace house in London's Notting Hill. One that occupies an entire floor of a regal Victorian building, just a cobblestone's throw from ritzy boîtes, exclusive restaurants, and one of the world's most glorious antiques markets? And one that allows you to entertain your own guests -- buzzing them inside for cocktails with a private doorbell, as you would at your own apartment? Perhaps $300 a night? $400? How does $160 a night sound? It's true: staying at The Main House, an intimate boutique property in Notting Hill -- one of the more expensive neighborhoods in Europe, if not the world -- is almost cheaper than staying home. And it's not the only hotel of its kind. For those who know where to look, there are actually lots of petite, extraordinary, wallet-friendly lodgings (where low prices reflect the property's modest size, not a deficiency in style or a low-economy special) -- even in the world's priciest cities. "Small hotels that have real character, a real sense of place, can be hard to find," Leffel says. "Some are family-owned, and others just don't have the marketing resources to get listed on the big American booking sites. That's why when you're looking [on those sites], especially for places to stay in big cities, you usually find yourself scrolling through page after page of chain hotels." A better idea, Leffel says, is to hunt down smaller Web sites that cater specifically to certain destinations (venere.com, a portal for travel in Italy, and travelfish.org, which focuses on Southeast Asia, are two examples he gives). Such sites are usually run by people who live in the countries they cover; many are even hosted by expats who've fallen in love with their adopted homes (and who don't mind sharing their knowledge with other travelers). Another source for locating under-the-radar hotel gems, says Leffel, is the good old-fashioned guidebook. Since guidebook writers usually have to cover a lot of territory on a tight budget, it's in their own best interest to find cost-effective lodgings that retain lots of local flavor. And finding the best guidebooks for your preferred destination won't even cost you anything; you can comparison-shop at your local library or bookstore. Doing such research can be well worth the effort. You may uncover rare treasures like Novecento Boutique Hotel, a historic nine-room locanda (guesthouse) in Venice just a few minutes' walk from St. Mark's Cathedral. Or like the Hotel Côté Cour, in Beijing, a sumptuous converted mansion in the "Old City," where the rooms surround a courtyard of blooming cherry and magnolia trees. Both these lodgings, and plenty more, can be had for less than $250 a night. So even if the economy's got you down, says Leffel, there's no reason you can't still stay -- and stay in style -- in some of the world's great cities. "You can still travel," Leffel says. "You just need to travel smarter."